Sometimes the best flavor combinations are created quite by accident. 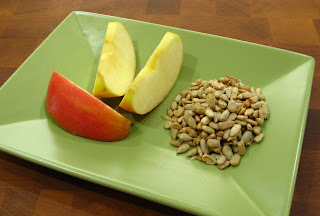 A healthy snack of a Pink Lady apple and a handful of roasted and salted sunflower seeds turned out to be one such discovery. I didn’t even think anything of the pairing at first, it was just what I had around. Then the flavors mingled in my mouth, and I knew I had stumbled upon something fantastic. Of course, it makes sense—apples and peanut butter are classic, but this combo’s even better. Hmm, I'm thinking this could be a great new garnish for a fall salad.